I am crazy excited about today’s post. And you might not know it yet, but y’all need to go ahead and get excited too. Because Walmart has upped their fashion game, y’all. Get ready to be super impressed. I mean, we all already knew that Walmart carried clothes and that their pricing was always super affordable, but here’s what we didn’t know, or at least I didn’t know…You can find some affordable pieces at Walmart that are actually DARLING. Not just kind of cute. DARLING. And I’m going to prove that to you today. When preparing for today’s post, I spent hours looking around online, getting familiar with the brands, and figuring out what direction I wanted to go with this post. I was pleasantly surprised at all they had to offer, and I actually had a lot of fun scrolling to find some real gems. 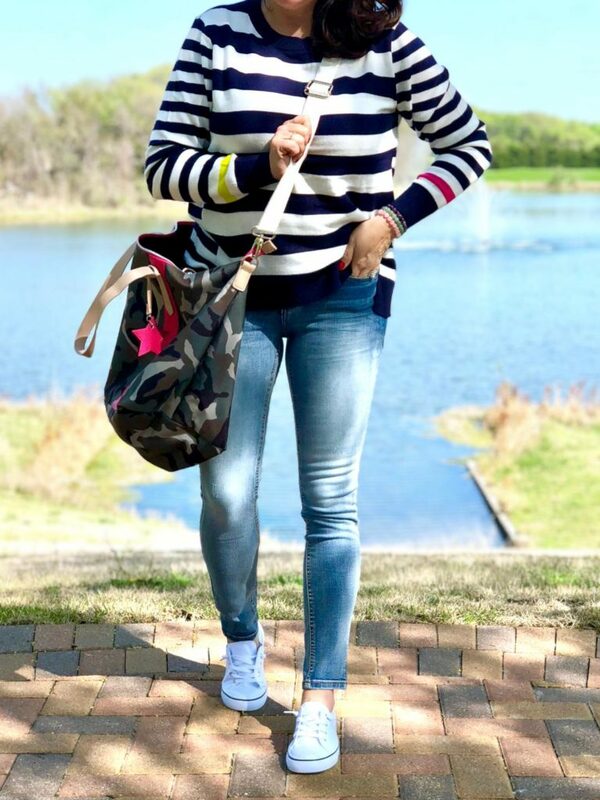 You can click HERE to check out their We Dress America campaign for the whole family and HERE to browse women’s spring trends. 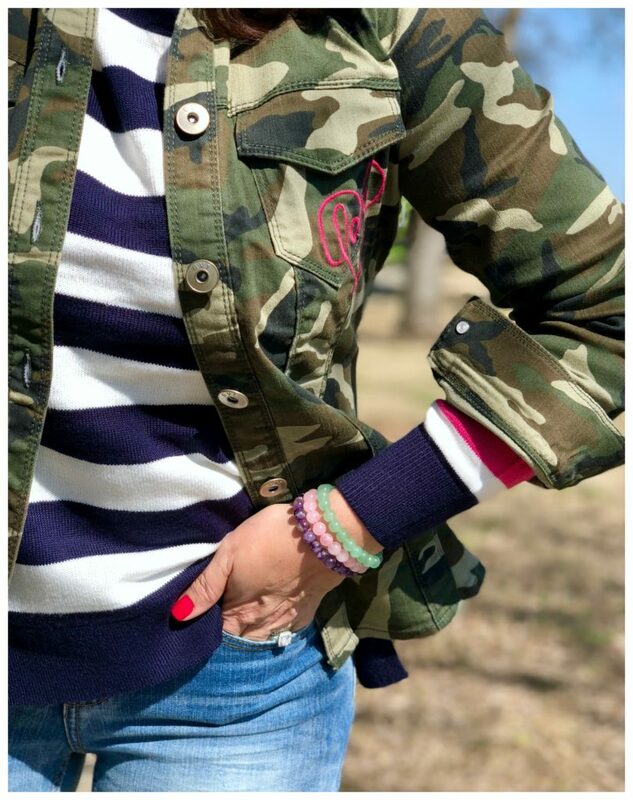 I placed a huge order (it had some hits and some misses), found some pieces that I absolutely loved, and decided to combine two of the most popular trends right now (STRIPES and CAMO) to create a couple of outfits for you today. And I really love stripes and camo together. 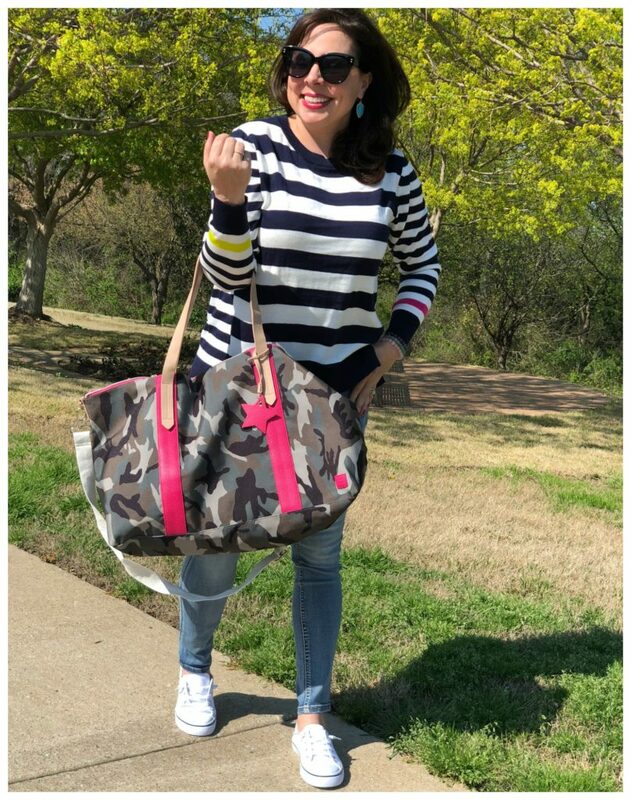 For look #1, I decided to combine a striped sweater with a camo weekender bag. This will definitely be an outfit I throw on for a day of errands when we are headed out of town to the ranch in the afternoon. Let’s break the outfit down. The jeans really surprised me because I was so impressed with the fit. I knew I loved the color wash when I saw them online, but the fit is what eventually sold me. They are slimming (very skinny throughout the thighs all the way down through the calves) and hit me at just the right point on my ankle. They do run small. I’m always a 4, and I definitely needed a 6 in these. When I took the 4s out of the box I immediately knew they wouldn’t work. Luckily I had read some reviews and knew I might need to size up, so I had already ordered the 6 too! 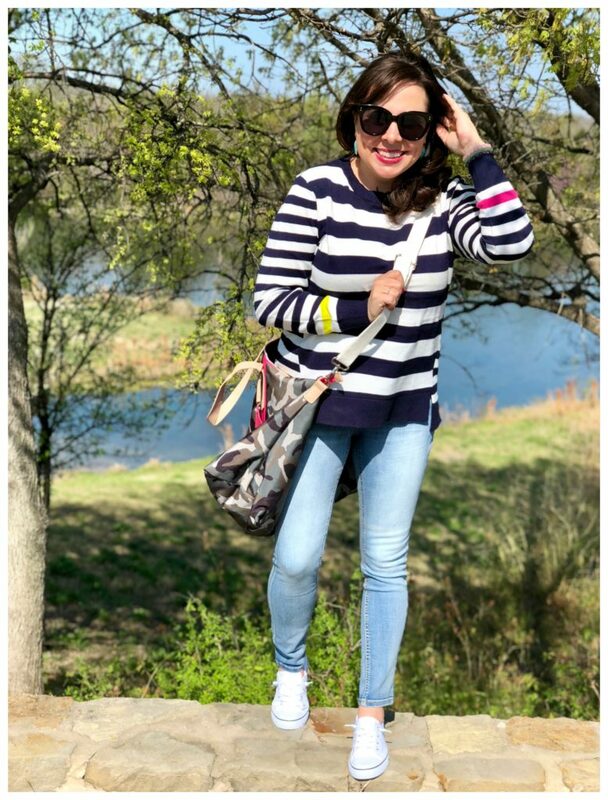 The jeans are from their Time and Tru line, and I liked a lot from this line! 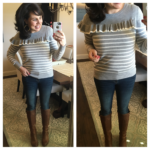 There’s no ifs, ands or buts about it….this striped sweater is darling. It’s from the collaboration with Ellen DeGeneres! I just love a lightweight sweater with a relaxed fit. There’s a really cute split high low hem, but it’s the extra color stripes at the bottom of each sleeve that really take it to the next level for me. The additional sunshine yellow and hot pink stripes are definitely a designer touch, but they don’t demand a designer price tag. The stripes are also smaller on the sleeves and the back, which also is a nice design element (which you can see best in the picture 2 pics down). I’m wearing a small in the sweater, so I think it’s true to size. The sweater also comes in a really pretty grey colorway too. The earrings are a beautiful turquoise, but they come in 5 other colors including a bright hot pink that I need. And get this, they are only $4.99. The bag is going to be great for travel. It holds more than you can imagine, and I know I’ll be using it for sheets and towels when we head to the ranch. I’m also thrilled to have a cute bag that I can now pack full of clothes, shoes, and other bags on days I’m shooting for the blog! 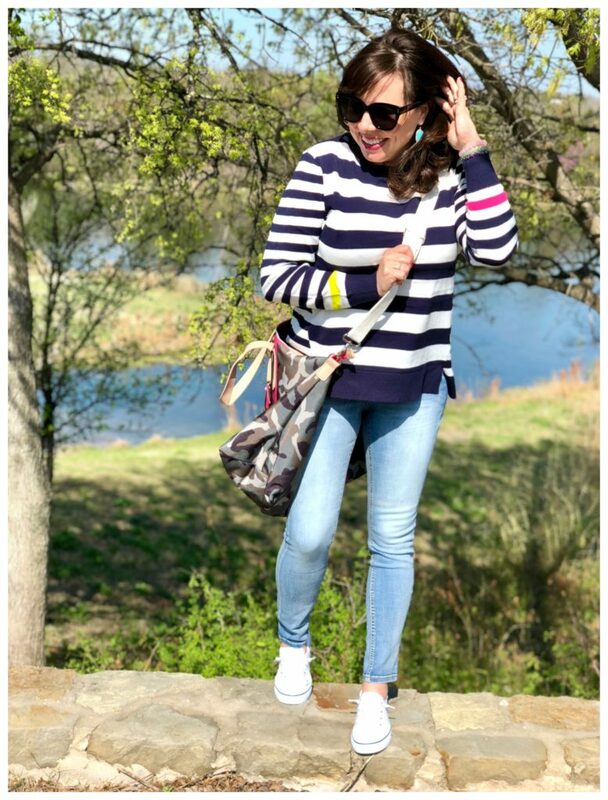 The cross body strap (seen above) is very functional, and I love the hot pink accents. 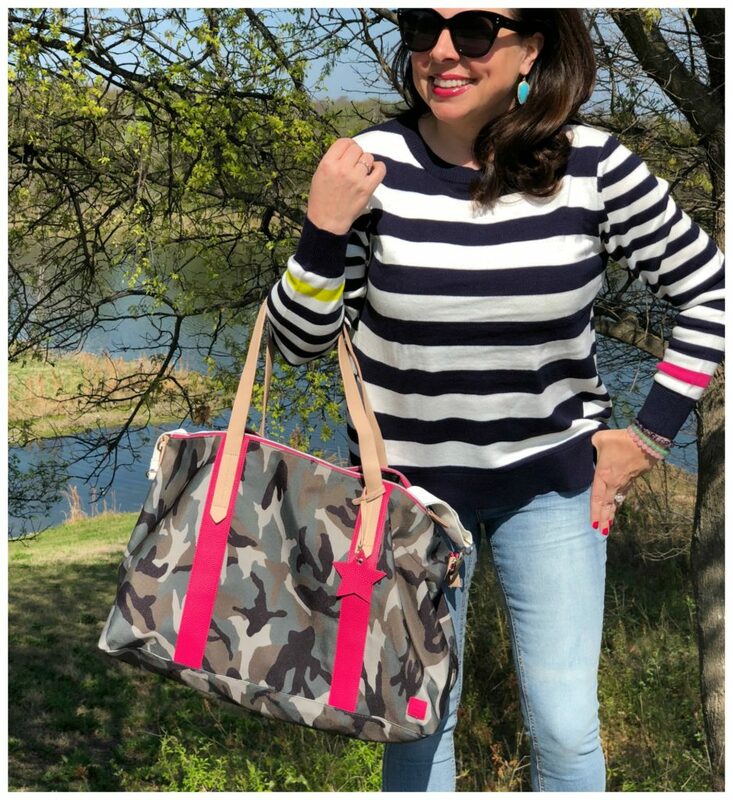 Click HERE if you love the idea of a camo bag, but you don’t need something quite so large. This little backpack is awesome and has the same pink and camo colorway. The sneakers are a good alternative for another brand of white scrunch back sneakers (that you see me wear a lot). I got my regular size, but I’m thinking sizing down a 1/2 would be a good idea. The entire outfit is bright, colorful, happy, and an incredible value. I wanted to give y’all an additional look with the camo and stripes combo, so I switched out the camo bag for a camo utility jacket. 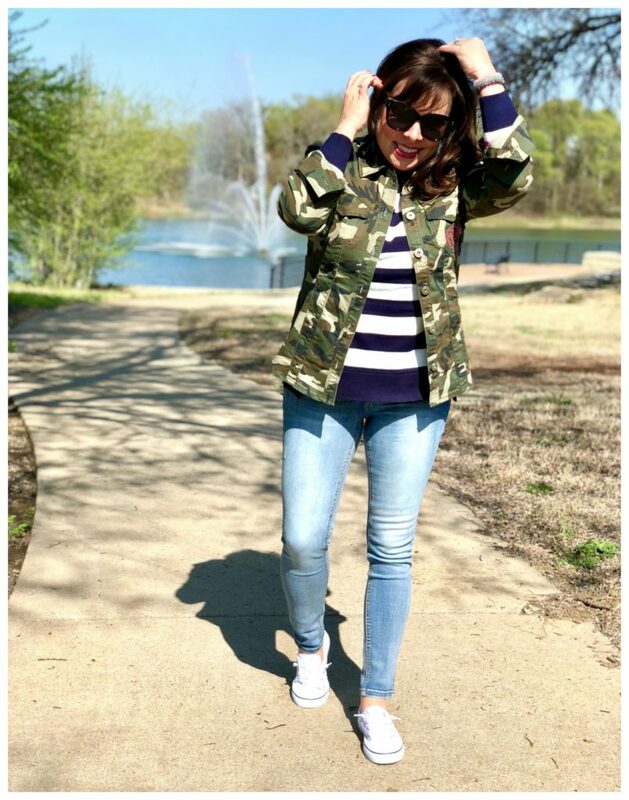 I’ve shown camo utility jackets on the blog a couple of times now, so I was super excited to find this one for such a reasonable price of $30! 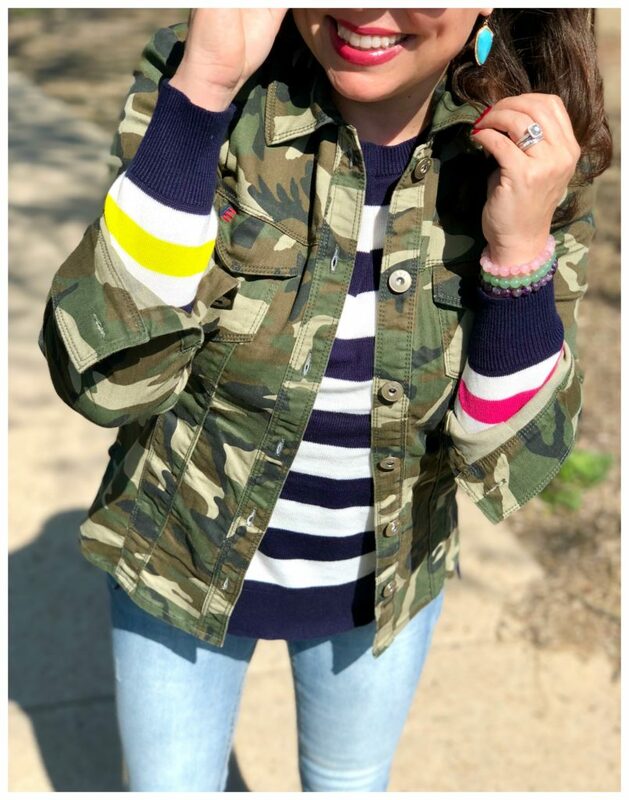 If you’ve been interested in a camo jacket, but didn’t want to spend a lot on a bold piece like this, the reduced price tag might push you over the edge! And let’s take another look at the bold and colorful stripes on each sleeve of the sweater. So stinkin’ cute. And before you go, I also wanted to provide you with a little beach/pool inspiration. HOW CHIC IS THIS SUIT! AND THE HAT! So….real question….are y’all as surprised as I am? There’s no denying that Walmart is doing a heck of a job proving to all of us that it has become a real destination for reasonable fashionable finds. And I’ll tell you this….although initially shocked…I’m here for it! I hope you were as impressed with the clothes and the prices as I am. 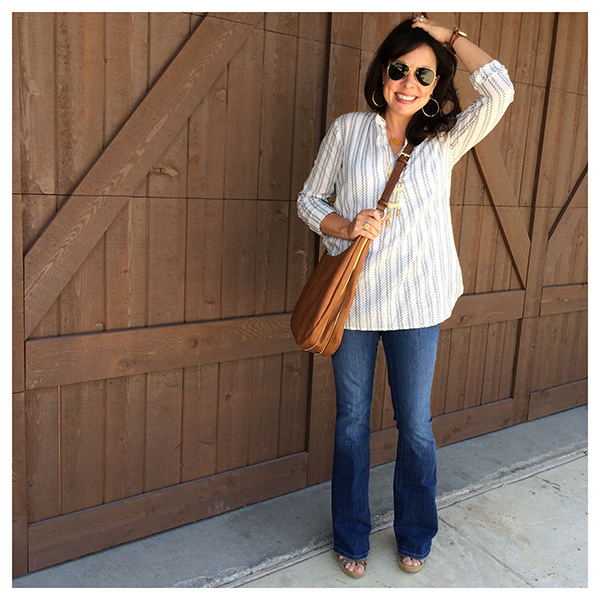 A huge thank you to Walmart and ShopStyle for sponsoring this post. Girl!!! I’m impressed!! You look darling in those outfits! 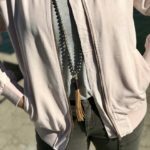 I’ve been seeing lots of other bloggers do Walmart posts, and I was wondering if you would too. I’m so glad you did! I was skeptical when I saw the first post, but after seeing so many posts, I’m impressed. I’m going to grab the navy striped sweater and the sneakers. Thinking about that swimsuit too! I’m a die hard Nordstrom shopper, but this post has me excited to shop Walmart! I love a really good budget friendly find. I mean…WOW! Who knew?!? I thought everything was absolutely adorable! I’ve never shopped at Walmart before, but I just put the entire swimsuit outfit in my cart. The prices are great, so I’m interested to check out the quality. Oh, hey Walmart!! Look at how cute this all was! Love it all! Did I miss the sizing info somewhere? OH….and a medium in the swimsuit and the braided sandals are true to size! I started buying their Time and Tru line last year and have been so impressed. I found several darling swimsuits for my teenager that was cute and appropriate! 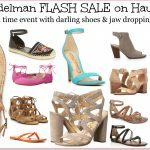 Love this post and your selections!! I actually bought the sneakers and the Camo backpack last week! I may need to get the striped sweater, so cute!! Keep these posts coming and thanks for your hard work!! You are my personal shopper!! Finally a post for us budget friendly babes! Thanks so much! excuse me while I go load up my cart! 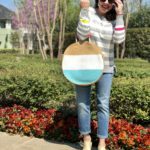 Will you do an updated post after you’ve worn and washed the items a few times? I’m totally skeptical that the items will last… I have that issue with old navy for myself. I like something then I wash it and it never fits the same and I don’t dry most of my clothes… I’m just really curious of the long term quality! I’m seriously impressed with Walmart too!! And your finds are amazing!! Thank you so much for doing a Walmart Spread!! I love how affordable it is & you you look so cute too! I looking forward to seeing more of your choice. You should follow the Instagram account WhoaWaitWalmart. They highlight amazing finds all from Walmart. I have followed them for years and they always surprise me! Cute things for your home, your kids, and you! I bought a sweater dress from WM and got SO many compliments on it. I also had good luck with a maxi skirt that I ordered. I definitely need to check them out more. Thanks!